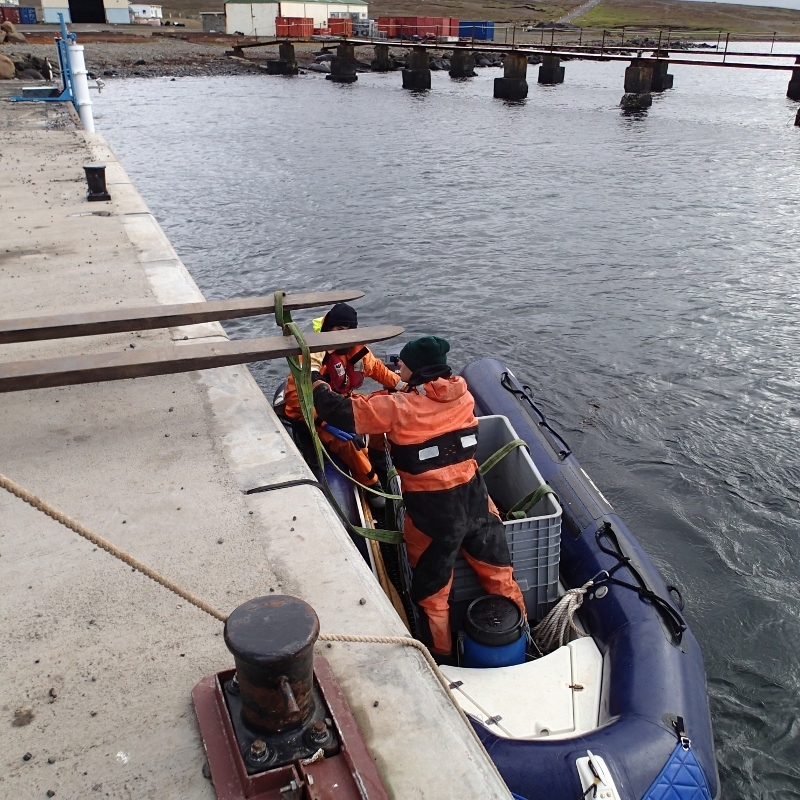 Transport of equipment between the ship and the shore. In the back. In the upper left is a penguin, curiously watching. Under the metal construction in the back of the picture the elephant seal are basking. Photo: Jan Grimsrud Davidsen, NTNU University Museum, CC BY-SA 4.0. The purpose of our expedition is to tag sea trout with electronic tags, which then uses a coded signal so send out information about ID number, water temperatures, and salinity. The acoustic signals are picked up by a hydrophone (an underwater microphone) which we place in strategic places in the ocean and rivers. 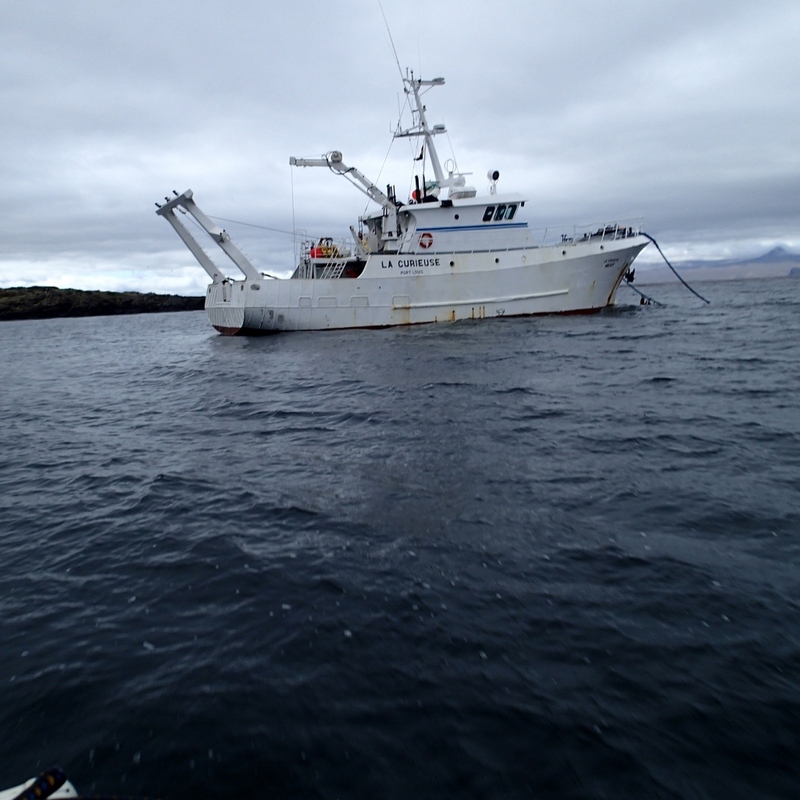 Here at Kerguelen the plan is to tag 52 sea trout and deploy 54 hydrophones which will operate for a full year. This method is commonly referred to as acoustic telemetry. The data received by the hydrophones will give ut information about the movements of the sea trout in the ocean and between the rivers at the edge of the northern part of the island, which it has colonised (the colonisation front). This type of information is an essential piece for fitting the jigsaw puzzle titled “Why isn’t there sea trout in all the rivers at Kerguelen?” (see Kerguelen part 1). Deploying hydrophones in a stormy ocean and leaving them unattended for a full year is risky business. We try to reduce the risk by submerging everything to the sea floor. In Norway we typically use a buoy at the surface so that we can easily retrieve the equipment again, but this will not work here. So all the stations has a 50 kg anchor, a deployment mechanism that, when triggered, will release the anchor, and two float balls which will make sure the hydrophones surface again after detaching from the anchor. 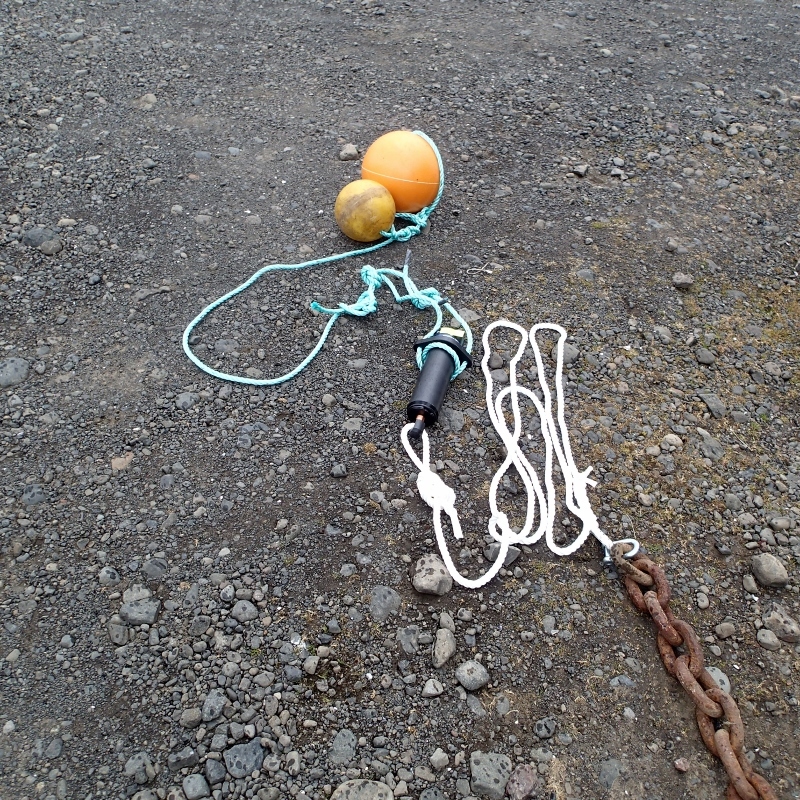 A hydrophone attached to an anchor and two floating balls. Photo: Jan Grimsrud Davidsen, NTNU University Museum, CC BY-SA 4.0. The last week has been spent preparing the last equipment and checking that everything fits together and no details have been overlooked. We only get one chance! Today the equipment was taken with Zodiak out to the boat La Curieuse which will transport us around and help setting up the hydrophones. Tomorrow the ship is transporting another team, and then it’s our turn. La Curieuse. Photo: Jan Grimsrud Davidsen, NTNU Vitenskapsmuseet, CC BY-SA 4.0. Neste artikkelKerguelen part 8 – Disaster!